by guest author Anna Coventry, Bubbles and Backbends. Hong Kong: A yoga haven? Yoga and Hong Kong. An oxymoron or a match made in heaven? Admittedly, being in a class on the 16th floor of a high rise, overlooking, well other high rises, is not exactly the quintessential yoga image, yet the industry here is BOOMING! My desire to ride the Hong Kong yoga wave is twofold. I am both a yoga teacher and an avid practitioner so of course I want to find out more about the people practicing and leading this beautiful art form in the Jewel of the Orient. In addition, I’m here for social reasons. This means I won’t be working and if I am going to survive 90 days in a city with as much pace, activity, and people as this one – I need yoga. Whenever I travel to a new place I like to find out about the local yoga scene. More than anything I am interested to know what gets people on the mat and what keeps them there. I had heard about the popularity of yoga in Hong Kong and I was intrigued to find out how something like yoga could possibly thrive in a place where time and space are such precious commodities. I suspected I was about to experience an entirely different kettle of yoga fish. I began by researching the city’s various studios by asking for recommendations and browsing online. I then selected four to visit in person so I could get an idea of both the type of yoga on offer as well as the vibe of the studios and people in them. I decided to start with the biggest first. This group had been recommended to me by several people and with five studios in the city and an impressive schedule that offered an array of yoga styles and teachers, I understood why. I chose to visit their Central location first. After getting out of the lift at Level 16, I found myself standing in a busy reception area with 3 people behind the desk, all occupied by telephones or patrons. I was actually quite grateful for the 5 minutes it took before it was my turn as I was able to absorb the atmosphere and activity around me that was such a stark contrast to anything I had experienced on my yoga journey so far. This location alone had 4 studios and it wasn’t even their biggest branch! After sneaking a look in the changing rooms I felt as though I was in a luxury inner city gym/yoga spa. There were endless showers, endless lockers and endless washroom attendants. There was even a whole shelf dedicated to clean towels that came in two different sizes. Um, wow. My second port of call was a completely different experience. I turned up at a healing centre that offered yoga classes amongst an array of other health and wellness therapies. The centre was on the 29th floor of a downtown high rise. Once I got over the initial vertigo, I began to appreciate being up so high as it was just so much… quieter. I was greeted warmly by the centre’s receptionist (yay!) and she was only too happy to let me have a peek at the yoga studio as there were no classes on that afternoon. It was beautiful and very Zen and I had a feeling I would be back before too long. After briefly discussing why I was there with someone over the intercom I was instructed to go and have a look around the 3rd floor studio and then head up to the office on the 15th floor. The studio had a truly authentic yoga feel to it. OK the view was a little average after my last experience and having a chat to someone in a cramped office wasn’t entirely yogic but it felt like a really good place to practice. My final yoga pit stop was back in busy Central. Even though I was trying to be as open minded as possible, I was secretly hoping that this one would offer the more classical style of yoga that I was accustomed to. Thankfully my wish was granted and I found myself in a tranquil haven that oozed traditional yoga. The director (who has practiced yoga since the age of 2) and most of the teachers are from India and their studios had statues of Ganesha and Shiva. Free meditation classes in a small city studio. Packed lunchtime yoga classes of 60 people. Partner yoga with a tiny Chinese woman (I am 5 foot 10). I witnessed an instructor stop a class to demonstrate a headstand with absolutely no support (I am still a little shaken). A 3-day life-changing workshop with the formidable Ana Forrest. Like many other places I have been, postures dominate the scene and there are students here who attend two or three classes in a day. Partner work during class and variations of the headstand were very common and I had to force myself to get over the fact that pranayama and meditation wasn’t a key feature (or sometimes a feature at all). My biggest challenge was maintaining an open mind and remembering what I was there for – to experience yoga as it is practiced in this city. So when a teacher came into one class and instructed us into Downward Dog before even saying hello, I swallowed the words ‘pardon’ and ‘me’, smiled and stepped back as asked. My wallet may have taken a hit (a casual class is $200-300HKD) but my yoga life has definitely been enriched. I have met teachers and practitioners from America, India, Australia, China, France, Brazil, South Africa, and of course Hong Kong, and even though the people and styles are as diverse and unique as the city itself, there was the same familiar quality there vibrating under the surface of everyone I met – Love. 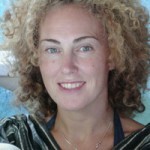 Anna is a 500hr RYT and writer who grew up in NZ and is now an international gypsy. She is currently on her second 90-day visit to Hong Kong, a city she has grown to love. 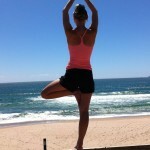 Passionate about holistic wellbeing Anna believes in the transformative powers of yoga. She enjoys sharing her thoughts, ideas and experiences in a light hearted and honest way on her website Bubbles and Backbends. You can also find her on Facebook and Twitter.